When I saw, Projective Texturing with Canvas by Steven Wittens http://acko.net/blog/projective-texturing-with-canvas, I was amazed. Yesterdaynight I was trying to same with Video using SVG. SVG has affine transformation but clipping part was difficult. So I modified the Original source code by Steven. Believe me it was , I just changed few lines and now the same demo working for Videos too. Demo is buggy. You have to wait for 22 seconds to load it, Then this will show wireframe and show projective video. 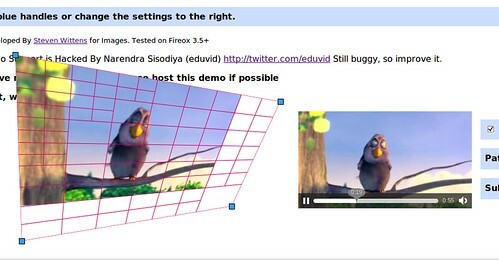 There is a bug in that in video is not 100% fit in wireframe. I will check it later. what (+where) is the code that you modified ?